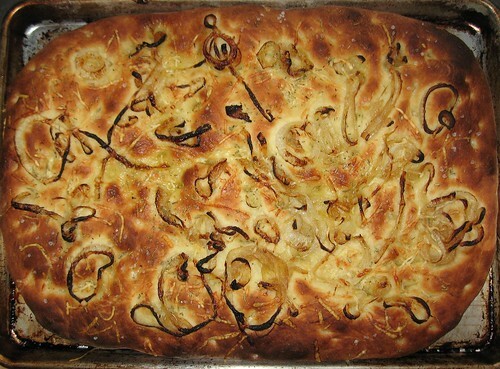 Caramelized Onion, Asiago Cheese and Salt Focaccia, originally uploaded by Seligmans Dog. The other night I got to partake in a food blogger thingy at Wild Goose Creative and we were all supposed to bring an item for a potluck type spread. I usually make a traditionally topped focaccia for something like this because it travels well and is pretty good served at room temp. This time I got a little crazy. I caramelized some onion, used some grated asiago on top and some Baleine coarse salt. When it was topped before cooking (1 Kg dough on a standard half sheet), it looked kind of bland and ... white. After cooking, the onion became crisped in places, the cheese melted and darkened and the whole thing came together more like a lightly topped pizza than a focaccia but I was quite happy with it. I think I'll make it again sometime.